The Orlando Museum of Art is delighted to present Zen Tales: The Art of Jon J Muth. 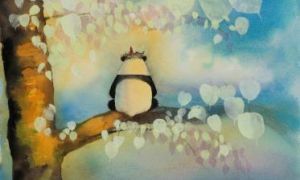 This exhibition is a retrospective featuring original art from the 2006 Caldecott honoree Jon J Muth whose watercolor art has been called “quietly life-changing” by The New York Times. He is the author and artist of The Three Questions and the bestselling picture book Zen Shorts, as well as a Gold Medal winner from the Society of Illustrators for his illustrations in Come On, Rain! This exhibition will feature Muth's works done in watercolor along with his work in gouache, pastel and ink. His art is heart-warming and each of the books takes the reader on a spiritual journey. 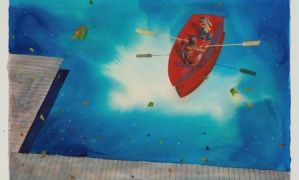 The pieces in this exhibition have been grouped into three sections: Tales from around the World, Poems to Learn by Heart (includes two of the books he collaborated with Caroline Kennedy), and Adventures of Stillwater and Koo (includes all the Zen books). Muth has had a lifelong interest in Asian Studies, including tai chi chuan, sumi ink drawing and chado, “the way of tea”. His studies have included stone sculpture and sho (brush calligraphy) in Japan. As a young man, Muth studied with two different artists: a romantic realist and a Neo-Dadaist poet. Muth had his first one man show at the age of eighteen and now exhibits his work internationally. For over twenty years Muth put pictures and words together in comics and graphic novels; culminating in the industry's highest honor, an Eisner Award for “The Mystery Play”. In 1996 he was invited by Japanese publisher, Kodansha to write and draw an original story for them. “Imaginary Magnitude” was published monthly for and ran for three years. Jon J Muth's books have received numerous awards and critical acclaim. His work has been translated into more than a dozen languages.